Tuesday Saturday 20th 1921 Weather some better. I helped Hattie wash some curtains. She went to the Annual inspection of The Home in afternoon. I ironed her curtains. Rob in bed. Cora with him. There was a hard storm in evening. 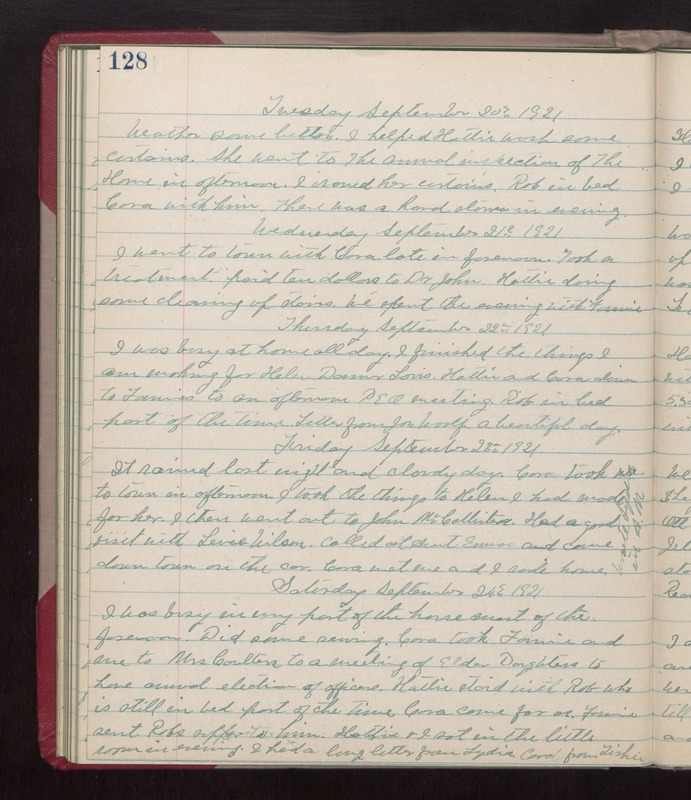 Wednesday September 21st 1921 I went to town with Cora late in forenoon. Took a treatment, paid ten dollars to Dr John. Hattie doing some cleaning up stairs. We spent the evening with Fannie. Thursday September 22nd 1921 I was busy at home all day. I finished the things I am making for Helen Danner Louis. Hattie and Cora down to Fannies to an afternoon P E O meeting. Rob in bed part of the tine. Letter from Joe Woolf. a beautiful day. Friday September 23rd 1921 It rained last night and cloudy day. Cora took me to town in afternoon. I took the things to Helen I had made for her. I then went out to John McCallisters. Had a good visit with Lovie Wilson. Called at Aunt Emmas and acme down town on the car. Cora met me and I rode home. wrote Lydia in AM. Saturday September 24th 1921 I was busy in my part of the house most of the forenoon. Did some sewing. Cora took Fannie and me to Mrs Coulters to a meeting of Elder Daughters to have annual election of officers. Hattie staid with Rob who is still in bed part of the time. Cora came for us. Fannie sent Robs supper to him. Hattie & I sat in the little room in evening. I had a long letter from Lydia. Card from Tishie.